Army Ranger Pat Tillman died in April 2004 in Afghanistan. Initially, the Army said the former NFL star was killed by enemy fire. Five weeks later, it was revealed that Tillman died from friendly fire. 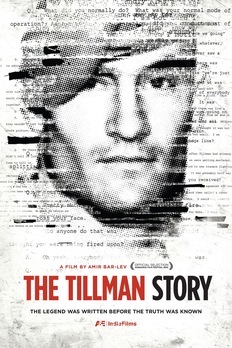 Watch the trailer for “The Tillman Story” after the jump. JEFFREY BROWN: Joining me now is Amir Bar-Lev, director of “The Tillman Story.” Welcome to you. AMIR BAR–LEV: Thanks for having me, Jeff. JEFFREY BROWN: How did this come about? AMIR BAR–LEV: Well, I was familiar with the story just like most Americans. Pat Tillman made a big splash when he left the NFL to join the military. He was killed in a friendly fire incident. I knew the basic bare bones of the story, but, you know, just the most cursory kind of investigation revealed that there was a ton of misinformation out there. Not only about Pat’s death but about what kind of person he was. JEFFREY BROWN: So when did you actually get involved and realize that there was a story there? AMIR BAR–LEV: 2007 is when we started. It took us three years to make. We started right around what you see at the end of the film, which is the congressional hearings that were held. So, you know, we looked into it and realized that there was a lot more to the story than most people knew and then a lot of that — three years was spent kind of hectoring the family trying to get them to agree to this. JEFFREY BROWN: Oh, so you had to go after them. AMIR BAR–LEV: Yes, absolutely. They are a very private family and never wanted all this attention, never wanted to be celebrities based on this tragedy. JEFFREY BROWN: Sort of like him, as it comes out. JEFFREY BROWN: So you went to them and said you’d like to tell the story and their first reaction was no. AMIR BAR–LEV: Yeah, or their first reaction was no answer. And then their second answer was no, and then we, just being the nudgy documentary filmmakers that we are, kept at it for I think — it must have taken about seven months and then eventually they agreed to it. JEFFREY BROWN: The story is, of course, about myth-making, as you said. It’s this hero, star football player, who gives that up, enlists after 9/11, dies bravely in battle —that’s the myth. And then it turns out that it actually is a myth. AMIR BAR–LEV: Yeah, and actually that the reality is more heroic and he’s just as brave as the myth. AMIR BAR–LEV: He did actually act incredibly courageously in his last moments, but they had to take that part of the story out in order to create this kind of cookie-cutter, Hollywood form that they sold the family and the country on. JEFFREY BROWN: Pat Tillman himself is gone, so the main protagonists become the family. You had to convince them, you said. Then what happened? Once they started to talk to you, clearly his mother had worked and worked and worked on this for years. AMIR BAR–LEV: Yeah, and they felt as though they had lost Pat twice in a way, once to death obviously and a second time to all this Hollywoodization and mythologization, as you say, about him. And one of the very interesting kind of moments for us right from get go is when they told us that they weren’t going to engage in that anymore. They weren’t going to engage in the hagiography approach to their son that happened on the news channels until this point. Actually, his widow said she wouldn’t talk about their life together at all. And she wouldn’t talk about his feelings. They were her two criteria for the interview. I mean, you can imagine. So I said, ok, well, let’s see — what does that leave us? JEFFREY BROWN: What does that leave, yeah. AMIR BAR–LEV: But, you know, what it does leave actually, to be serious about it, is that actually something more interesting than the fact that she was the cheerleader and he was the head of the high school football team, which is the process by which Pat Tillman was Paul Bunyan-ized, you know, was turned into somebody he wasn’t, not just by the government, which is obvious, but also by the rest of us. JEFFREY BROWN: Did you in the end feel that you were able to strip away all of that mythology and cloud and have any sense of who he really was? AMIR BAR–LEV: I hope so. I mean insofar as a film can do that, yeah, I think so. I mean, and I won’t take too much credit for that, it’s a remarkable family and they weren’t going to let the film to be made any other way. It took us a year to edit for instance, just to kind of sort through this stuff and make sure we weren’t doing the same thing. But I have to say we came to like Pat even more. But it’s a story that challenges us to understand ‘hero’ in more complex ways. JEFFREY BROWN: Now, of course, there is also this interesting connection to news this week — General Stanley McChrystal. Explain that part. AMIR BAR–LEV: General McChrystal is a central figure in the Tillman story because he authored what the family thought was kind of a smoking gun, this P4 memo that was leaked I think in 2007. And for them was just proof positive that everything that they had been saying was true, which is that the military to the very, very highest rank knew that this was friendly fire. AMIR BAR–LEV: Well, he knew that the Bush administration and the Pentagon were planning on making this a photo-op for lack of a better word. And he wanted to warn people that it was friendly fire and they should be careful to not talk about how he died. Unfortunately the smoking gun never really registered as such because when the Tillman family showed it to Congress and presented it to the congressional committee, all of the recipients of the P4 memo basically pretended they never got it — very unbelievable kind of story about this very important memo that would have gotten to them. And actually for all intents and purposes the country bought it. AMIR BAR–LEV: I ruined the ending. JEFFREY BROWN: No, but just generally — is this resolved in your head? AMIR BAR–LEV: No, absolutely not. And when you take the temperature of people about Pat Tillman, you find actually not uncommonly, in like chat rooms and stuff, that people say, enough already. You know, we know the story, many people die for their country and why is Pat Tillman special and stuff like that, and it’s just, it’s frustrating because the family has always been very clear from the very get go this isn’t about Pat. They say very clearly they are never going to get Pat back, but this is about something larger, which is that the soldiers who die for this country, who fight for this country and their families deserve the truth. They don’t need to be lied to. The country doesn’t need to be sold these kinds of Hollywood stories and this is about next Pat Tillman, it’s not necessarily about Pat. JEFFREY BROWN: August 20. Amir Bar-Lev, thanks for talking with us. AMIR BAR–LEV: Thanks for talking with me, Jeff.